Delhi: Delhi is the capital city of India and considered to be the city with a heart. It is featured with historical monuments, shopping malls, and Mughal gardens and it is the blend of traditions, culture diversity and beautiful architectures. The tourist places of the Delhi are Qutub Minar, India Gate, Lotus Temple, Jama Maszid, Akshardham Temple, ISKCON Temple, Red Fort and many more beautiful buildings here. Delhi, the city with the heart for everyone is the best destination to explore North India.Delhi Taxi Packages. Agra: Agra, the Taj city very well known as the city of love, is a very beautiful destination to explore North India. It is most popular for the Taj Mahal, a symbol of Love which is one of the seven wonder of the world and Also it also registered in 50 most famous tourist destination in the World that makes India very proud. Taj Mahal is built by Shah Jahan in the memory of his beloved Mumtaj. The other beautiful attraction of Agra are Fatehpur Sikri, Humayun's Tomb, Jama Masjid Itimad-ud-daulah's Tomb and many more where you can explore the city. Shimla: Shimla is also known as Queen of Hills, the most popular hill station situated at a height of 2200m in Northern India and the capital city of Himachal Pradesh in India. It is very well known for its natural beauty and the view from the mountains is very awesome. The main attractions of the Shimla are Mall road, The Ridge, Scandal Point, Jakhoo Temple, Institute of Advanced Studies and many more where you can explore the Shimla.Agra Same day Tour Package. Varanasi: Varanasi is very well known for the spirituality of North India. It is also known as Kashi or Banaras located on the bank of river Ganga. It is most popular pilgrimage destination in North India. It is considered as the holiest city or the religious capital of India and a large number of the temples here which attracts the pilgrims. The River Ganga is a major attraction and the evening Ganga aarti is also most popular. Golden Triangle Tour with Varanasi. Kashmir: Kashmir is famous for its natural beauty and stunning views. 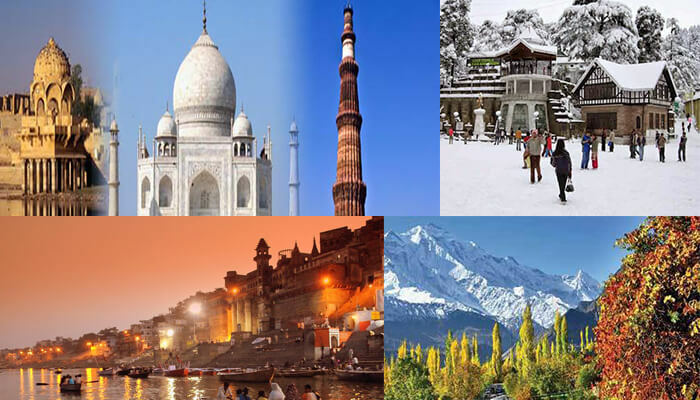 It is the breathtaking destination to visit in North India. It is also considered as heaven on the Earth. It is surrounded by the Himalayan and Pir Panjal mountain range. The major attraction of the Kashmir are Dal Lake in Srinagar, Mughal Garden, The gorgeous valleys of Sonmarg, Nagin Lake, Strawberry Field and Apharwat Peak where you can explore Kashmir and can take a great experience.